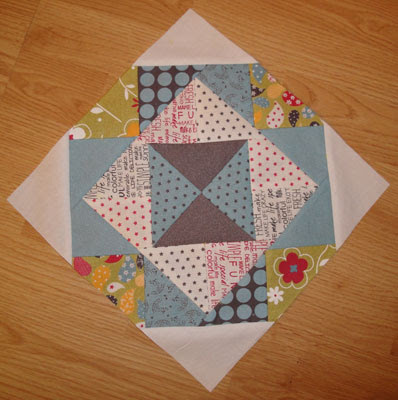 I was playing around with some triangles cut from a Make Life charm pack to create a quilt block (picture below). I was so proud to think that perhaps I had created a new block. But c'mon, really? Of course the pattern already exists. According to one of my quilting books the block is very similar to the traditional quilt block called Gentleman's Fancy. But mine has a slight twist in that the block is entirely made up of triangles. Want to make one with me? 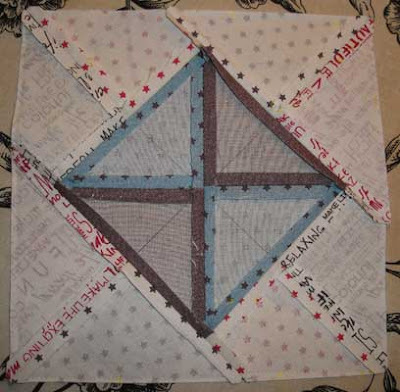 I'm calling this "A Charmed Gentleman"
Each quilt block uses 12 - 5" squares. Try to select squares that vary in scale and color for maximum contrast in the block's layout.. 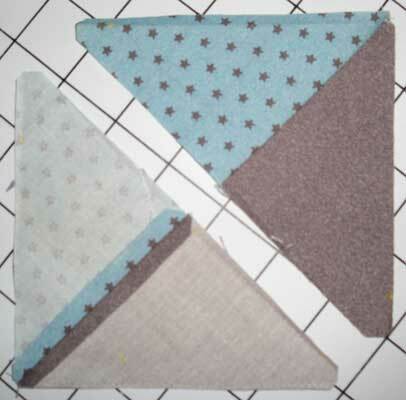 I used a triangle template to cut 2-3" half-square triangles (HST) from each square. 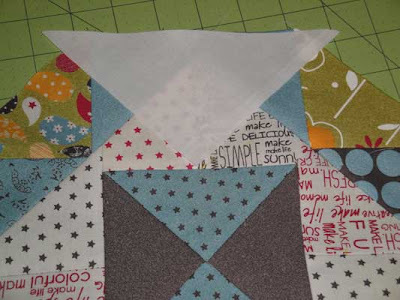 If you don't have a template, you could also just cut each square on the diagonal and end up with 2 HST. 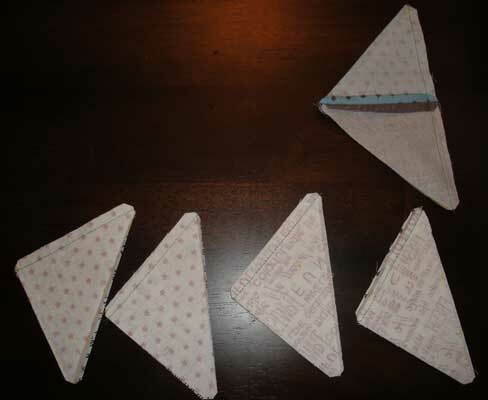 Step 3 - Play with your triangles until you like the layout. This is the fun part. In my example I decided to alternate between darks and lights to play up the contrast and define each "ring" of the block. You'll likely find that the color placement of your triangles can make a huge difference in the look of your block. For example, in the sample block, the look would totally change if the green triangles were changed to blue. To keep track of your layout, I recommend taking each triangle out for piecing as you need to and leaving the rest of the block in place. Take your four center triangles and pair them up, right sides facing each other. 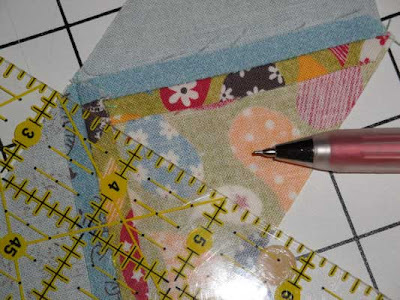 Sew each pair with a 1/4" seam. 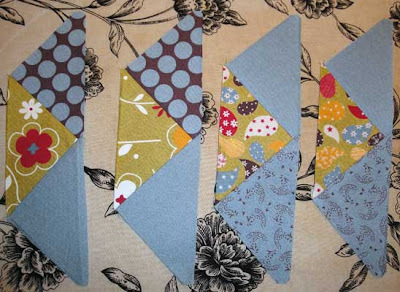 You will need to make two pairs of triangles. Press the seams open. Now join your resulting two triangles together, right sides facing each other, to make your center block. Press the seams open. 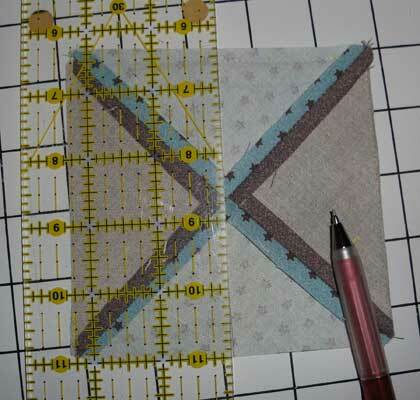 Still using your layout as a guide, piece together each pair of triangles with a 1/4" seam. Press each seam open. To align the center of your triangles with the center hourglass block, mark each center point in the back of your hourglass block. 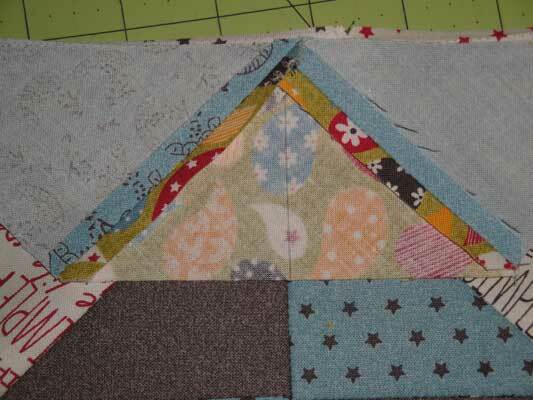 Now align the center seam of your triangle with the line you drew on the back of the center hourglass block. 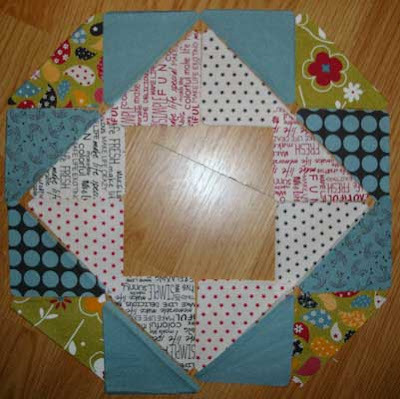 Sew one side, then sew the opposite side of the center hourglass block. Press seams open. Your block should now look like this. Go ahead and trim the triangles' dog ears. 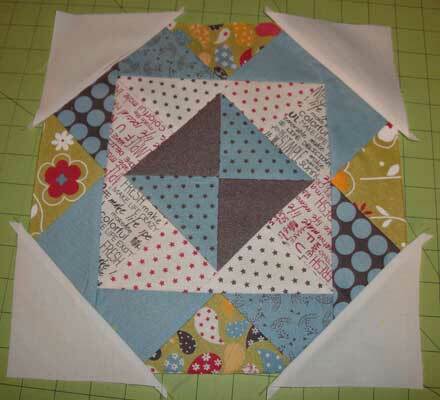 Now add the triangles to the other sides of the center hourglass block. Press seams open. Your block should now look like this. Still referring to your layout, carefully piece the remaining triangles to make the four rows to complete your block. Sew with a 1/4" seam and press the seams open. You should have four pieces that look something like this. Mark the center of each row in the back to help align the row with what you've pieced so far. 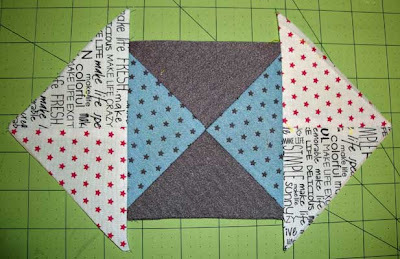 Align the center of your row with the pieced block center. 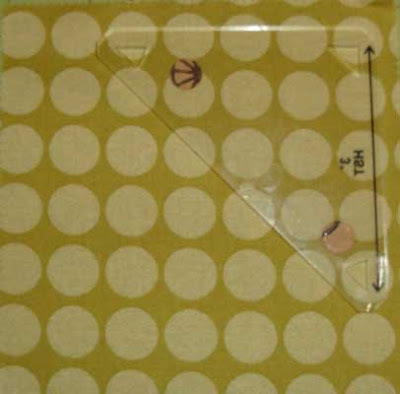 Use a 1/4" seam and press the seam open. Then add the opposite row. Trim the resulting dog ears. Now add the two remaining rows to your center block. Press the seams open. Your block should now look like this. Take the time to admire your handiwork. 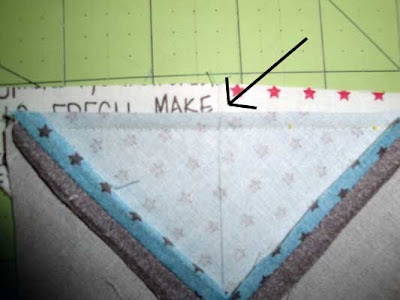 Step 7 - Add the setting triangles. 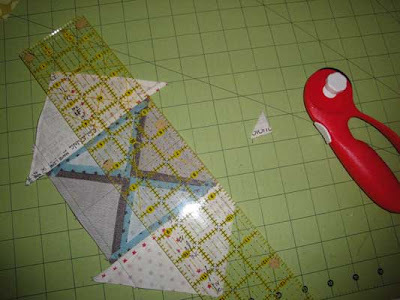 Cut 2-5" squares diagonally to make your setting triangles. 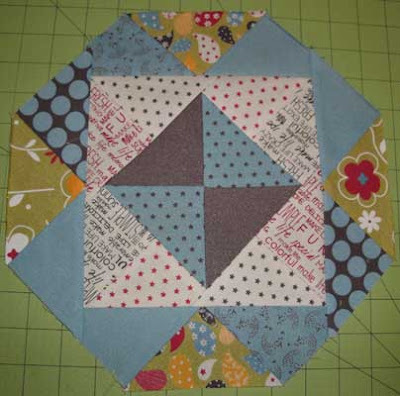 I chose to use white to emphasize the shape of the pieced block, but you could also use additional squares from your charm pack. 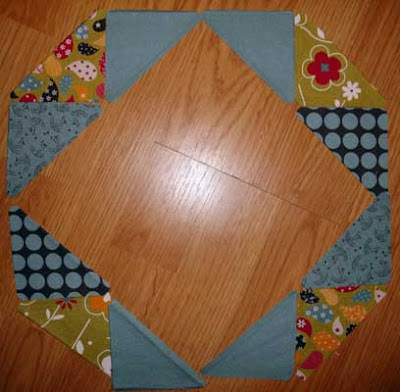 Align the center of your setting triangle with the center seam of your center block. 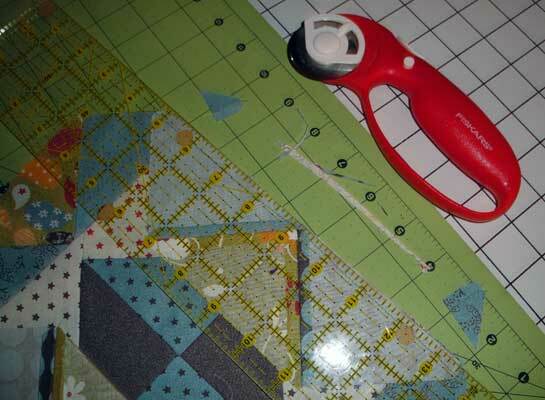 Then piece using a 1/4" seam and press open. If you find that the seams are getting too bulky, you could just press the seams to the least bulky side. Making sure that the triangle is centered is easy; just match the triangle's point with the center seam of the block. 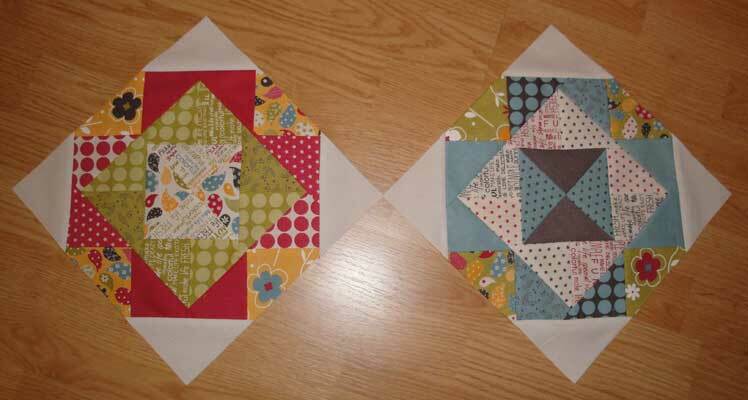 Add the setting triangles to each corner of your block. Your block should now look like this. I used a 12.5" square ruler to trim the setting triangles and square my block. 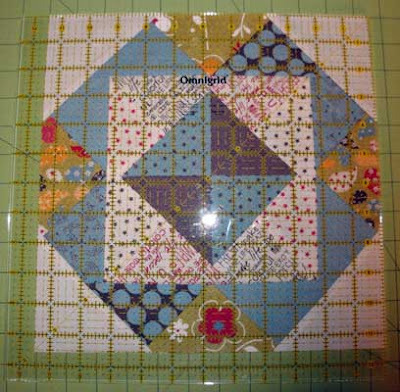 The finished size was 11.5" square. That wasn't so bad, right? One charm pack plus some fabric from your stash to make the setting triangles yields 3 blocks. Please let me know if anything is unclear. If you do make the block, I'd love to see it.